Barefoot Tyler: Hot Hot Hot! Blisters! 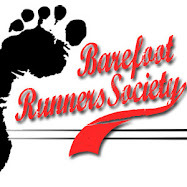 Sooner or later, almost every barefoot runner will run in a temperature that their feet aren't quite ready for, resulting in a set of blisters. The trick is to know your limits and stop running when you feel is necessary. Yesterday I tried running in a new location. It has been sooo freaking hot and humid here. I mean, seriously wtf is this garbage? I was actually running a little earlier that that(around 6:30), and I know it was hotter. Anyway, when I first saw the new location(Rock Creek in Dawsonville) from the road I thought it would be a tree covered and shaded dream. Unfortunately this was not the case. In fact, 90% of the path was golf-course like, meaning the sun was-a-roastin'! Great, so I step out of my car and it is hot. It doesn't help that my car has no AC, but I digress... So I start my run. About a mile in I am noticing that my feet are getting more and more tender. I increase my cadence and truck on. Finally, at the end of the 5K I walk slowly through the grass back to my car. My feet are a slightly tender at this point, but there are no signs of blisters! Now the main predicament comes the next day. My feet are still tender. When should I run? In the cool morning with little recovery or during the hot after with more recovery? Cool morning it is! I met up with my mom and we did a slower 5K. Its nice to have someone to talk to while running and my mom does a great job with that. During the run my feet held up fine. The only thing that hurt was small rocks that stuck to the bottom of my feet. After coming home and taking a shower I decided to take a picture of my feet. The burnt skin was starting to show, but it honestly wasn't that bad. I have had much worse burns that I have learned from. So what is the point of this post? 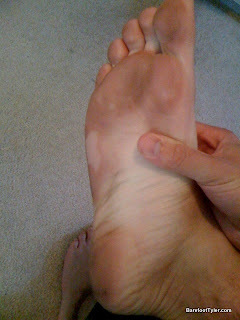 Well I feel like the last time I burnt my feet(early in on my barefoot journey) I was much worse. I could barely walk without the help of a medic, some socks, and a pair of Crocks. My feet are becoming more used to the heat and more durable. Just think if I continue to run in the heat. Nothing could stop me! Youch. Glad to hear your feet are getting tougher though!